Acne (pimples) is a long-term skin condition characterized by areas of blackheads, whiteheads, pimples, greasy skin, and possibly scarring. The resulting appearance may lead to anxiety, reduced self-esteem, and in extreme cases, depression or thoughts of suicide. Acne is a skin problem which mainly happens in teenage. 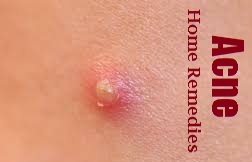 The pimples formed can leave marks later. Though pimples are normal in that age it can increase because of so many factors like improper diet, hormonal imbalance, smoking, alcohol, mental tension, uncleanness, constipation, less water intake etc. Practicing good hygiene, including regularly washing skin areas with neutral cleansers, can reduce the amount of dead skin cells and other external contaminants on the skin that can contribute to the development of pimples. However, it is not always possible to completely prevent pimples, even with good hygiene practices. 1. Drink at least 2-3 litres of water a day and specially 1 to 1.5 litres empty stomach in the morning. 2. Keep the stomach clean, avoid constipation problem and have fibrous, fruits and raw vegetables. 3. Keep washing face frequently and don't go for soaps, cosmetics which increases Acne problem. 5. Avoid tensions and have a good sleep. 1. Sandalwood paste applied on the face helps to overcome Acne and remove its scars. 2. Cucumber (Kheera) juice mixed with Lemon juice applied on the pimples helps to get relief from Acne and Acne scars. 3. Mint (Pudina) juice applied on the face also helps to get relief from Acne and Acne scars. 4. Water boiled with Neem leaves used for taking steam helps in reducing Acne and Acne scars. 5. Gram flour (Besan) mixed with Buttermilk applied on the face reduces Acne and Acne scars. 6. Raw Papaya (Papita) paste applied on the face helps to cure Acne. 7. Nutmeg (Joy phal) grinded with Milk applied on the face helps a lot in reducing Acne and Acne scars. 8. Powdered Dry Orange skin applied as a paste or Orange skin rubbed on the face helps to remove Acne scars. 9. Water boiled with Neem leaves used for washing face removes extra oil from the face and reduces pimple or Acne. 10. Tomato rubbed on the face or Tomato juice applied on the face helps to remove Acne scars. 11. Aloe Vera (Gwar Patha) is a best medicine for pimples or Acne. Aloe Vera leaf rubbed on the face removes Acne and Acne scars. 12. Carrom seeds (Ajwain) grinded with Curd applied on the face also helps to get rid of Acne or pimples. 13. Fenugreek (Menthi) paste also helps in getting rid of Acne and its scars. 14. Basil leaves (Tulsi) rubbed on the face helps to remove Acne scars. 15. Lemon juice applied on the pimples also helps to remove Acne and its scars. 16. Washing face with Tender coconut water is a good remedy to overcome Acne scars. 17. Coriander (Dhania) juice mixed with Lemon juice applied on the face also removes Acne and its scars.